ELIA NDEVANJEMA SHIKONGO, holds a BA LLB Degree, and is an admitted legal practitioner and Notary Public of the High and Supreme Court of Namibia. He specialises inter alia, in commercial and corporate law, drafting of contracts and legal opinions, international arbitrations and litigation. 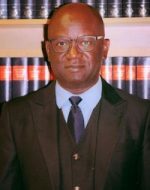 He has on occasions served as an Acting Judge of the High Court of Namibia, and has more than 20 years experience as a private legal practitioner. He is active in the aviation, oil and gas, mining, banking/financial, telecommunication, fishing and transport sectors. Through him, the law firm maintains a healthy relationship with several private and public entities. He is currently a Chairperson of the Minerals Ancillary Rights Commission, under the auspices of the Ministry of Mines and Energy as well as Craton Mining. He has served on numerous other boards, such as the internationally listed HRT Oil and Gas Company, being founding Chairperson Namibia Wildlife Resorts, Fishcor Board, Counselor and President of the Law Society of Namibia, Falcon Investments and Phincon Enterprises (Pty) Ltd.
Namibia has emerged from a history in which law was used for many years as an instrument for oppression and discrimination based on race, colour and gender. The consequences of such historical impacts are still existing today. In view of the above, the Firm is committed to meaningful participation of the previously disadvantaged persons in all areas of the economy and has over the years trained many Candidate Legal Practitioners from previously disadvantaged groups, and empowered them to progress within the Firm and the profession in general. SLC was established in 1997 by its senior partner, Elia Shikongo who has been in private practice for more than 21 years. The firm operate predominantly as a commercial/corporate firm, and has over the past years built up a diverse legal consultancy practice, acting either solely or in joint ventures with other professional service providers.